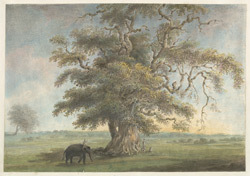 Watercolour of a trees near Rajmahal from an album of miscellaneous views of Bengal produced for Lord Moira, afterwards the Marquess of Hastings, by Sita Ram between 1820-21. Marquess of Hastings, the Governor-General of Bengal and the Commander-in-Chief (r.1813-23), was accompanied by artist Sita Ram (flourished c.1810-22) to illustrate his journey from Calcutta to Delhi between 1814-15 and his convalescent tour in the Rajmahal Hills in the winter of 1820-21. Illustration of a mango and semal tree entwined. Inscribed below in pencil and ink: 'United Mango and Semul Tree near Furraka.' Farraka is located near Udhua Nullah, just below Rajmahal.